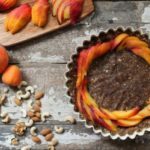 Raw Peach Tart – Raw Peach Tart, a raw, vegan, and gluten free version of a classic peach tart. Made from minimal ingredients, non processed. Perfect for summer gatherings. – Crust: Dates, pitted, cashews, walnuts, almond, goji berries (optional), lemon zest, ground cinnamon, sea salt, Filling: fresh peaches, sliced (about 4 peaches or until your tarts are filled! ), juice of 1/2 lemon, • honey or maple syrup drizzle on top (optional), Crust: Grind all nuts in a nut grinder or Vitamix until finely chopped. ; Combine all the CRUST ingredients into your Vitamix (or high speed blender or food processor) until well combined. ; This crust will be sticky but should hold together when pressed in between your fingers. If your mixture is too wet or moist simply add more ground nuts. If it is not sticky enough to hold together add a further date at a time until it is. ; If you’re using mini tart pans, divide the mixture evenly. ; Using your tart pan (25 – 30 cms) or mini tart pans, gently press the crust into the pan and up the sides. Press firmly until a crust is formed. Alternatively roll out the crust between two sheets of baking paper and cut out bases using a pastry cutter. ; Chill in the freezer (at least 30 minutes) or refrigerator (overnight), to set the crust. This is not essential but makes the crust easier to cut. ; Filling: Cut the peaches in half, remove the pit. ; Thinly slice the peaches long ways (as shown in the picture), and arrange in a circular pattern or simply lay flat on the crust. ; Mix the lemon juice and honey or maple syrup together and drizzle over the top. alternatively serve with a balsamic reduction- see recipe link below. ; Serve immediately or wrap tightly with clear wrap and keep in the refrigerator. FREEZING You may also keep the crust in the freezer until you need it. Even if you top with fresh peaches, you can still keep this tart fresh by freezing it but the peaches will turn slightly brown due to the freezing-thawing process but they are still delicious and fresh! If you have any nut allergies to the ones used in this recipe, simply use seeds instead of the nut that you’re allergic to (for example, sunflower seeds, pumpkin seeds, or any other nut that you’re not allergic to). Grind all nuts in a nut grinder or Vitamix until finely chopped. This crust will be sticky but should hold together when pressed in between your fingers. If your mixture is too wet or moist simply add more ground nuts. If it is not sticky enough to hold together add a further date at a time until it is. If you're using mini tart pans, divide the mixture evenly. Using your tart pan (25 - 30 cms) or mini tart pans, gently press the crust into the pan and up the sides. Press firmly until a crust is formed. Alternatively roll out the crust between two sheets of baking paper and cut out bases using a pastry cutter. Chill in the freezer (at least 30 minutes) or refrigerator (overnight), to set the crust. This is not essential but makes the crust easier to cut. Thinly slice the peaches long ways (as shown in the picture), and arrange in a circular pattern or simply lay flat on the crust. Mix the lemon juice and honey or maple syrup together and drizzle over the top. alternatively serve with a balsamic reduction- see recipe link below.